First Taste: Rasa's Colorful, Casual Indian Food — Drink | Dine | D.C. 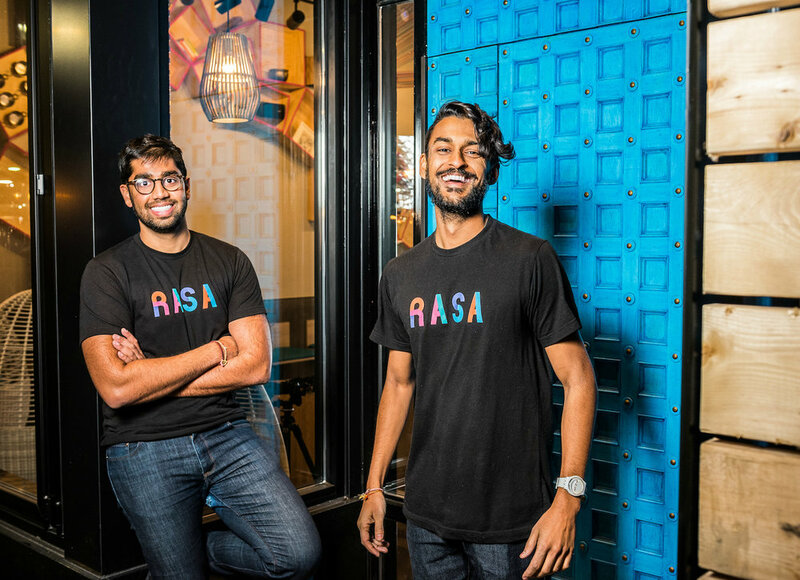 The first thing you notice about Rasa is the restaurant’s illuminated rainbow logo. Then there’s the custom blue entry door, which opens to a dining room popping with turquoise seats next to vibrant paintings. It all leads to a fast-casual kitchen that turns out food that’s just as bold and bright as its surroundings. Navy Yard’s new fast-casual Indian restaurant, meaning “essense of enjoyment” in Sanskrit, is the longtime passion project of Rahul Vinod and Sahil Rahman. The two grew up around Indian restaurants and each other. Their fathers—K.N. Vinod and Surfy Rahman—own Indique and Bombay bistro and have been working in the D.C. area for decades. For the younger duo, that exposure sparked a desire make their own mark on Indian food and make the cooking accessible to a larger audience. They’ve been working toward it since their teens and even traveled across India to research the concept. The result is a menu that is diverse, reflecting the range of ingredients found across India. Drink Dine D.C. stopped by a recent preview to sample the food. As with most fast-casual eateries, ordering here starts with a base. Basmati rice is a fine choice, but don’t shy away from a bed of “supergrains” or “sexygreens,” or the paper-thin South Indian rice noodles. Next up are the proteins, which include a tender chicken tikka, tumeric ginger shrimp, and a spicy beef. Vegetarians can fill up sweet potato tikki or satisfying green jackfruit without missing out on any of the fun. Sauces range from a mild tomato garlic to a spicy tamarind chili. That then gets topped with vegetables—the sautéed spinach and charred eggplant are winners—and finished with a wide selection of possible garnishes and chutneys. Naan and mini samosas are available as well. If building your own bowl seems too tall a task, pick the safety of one of Rasa’s signature bowls like the “Aloo Need Is Love” or the “Open Sesame.” Adjustments are welcome, and the restaurant’s staff are well informed about the many ingredients. Bowls here range in price from $9 to $12, making for a nice value considering the amount and quality of product. Whatever way you decide to go, there’s enough variety here to make many return visits without getting bored. And diners still mourning the loss of Shophouse will no doubt appreciate a new local spot to get a quick curry fix. Rasa also offers some refreshing beverages to douse the heat of what’s in your bowl. Options include chilled fresh whole coconuts, a masala gin and tonic, beer and wine, and a lineup of homemade juices. For a sweet finish, grab a masala chai chocolate chip cookie and kulfi pop (an Indian ice cream) on the way out. As early as it is, Rasa seems primed to thrive in a city that has embraced fast-casual cooking and interesting, healthy flavors. Rasa is located at 1247 First St. SE. Hours are 11 a.m. to 10 p.m. seven days a week.